To succeed--or even to survive--in today's global economy, companies must refocus and reorganize themselves around their processes: the end-to-end sequences of tasks that create customer value. 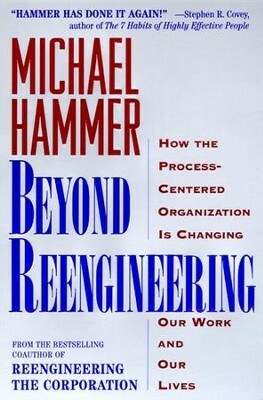 In this groundbreaking work, Michael Hammer mines the experiences of individuals and organizations that have already reengineered to offer a compelling vision of an imminent future. Beyond Reengineering offers an understanding of what we must all do to prepare ourselves and our children for an economy in which all the familiar rules have been broken. It is required reading for executives and frontline workers, for studnets and investors, for everyone who wants to be prepared for the new world that is at our doorstep. Jobs: What does process-centering do to the nature of jobs? What does a process-centered workplace feel like? Managers: What is the new role of the manager in a process-centered company? Education: What skills are vital in the process-centered working world, and how can young or inexperienced workers prepare? Society: What are the implications of process-centering for employment and the economy as a whole? Investment: What are the characteristics of a successful 21st-century corporation? An informed look at one of the most profound changes to ever sweep the corporate world, Beyond Reengineering is the business manual for the 21st century. I'm the author/artist and I want to review Beyond Reengineering - eBook.